Rally begins at Carnac Bunder, Mumbai. 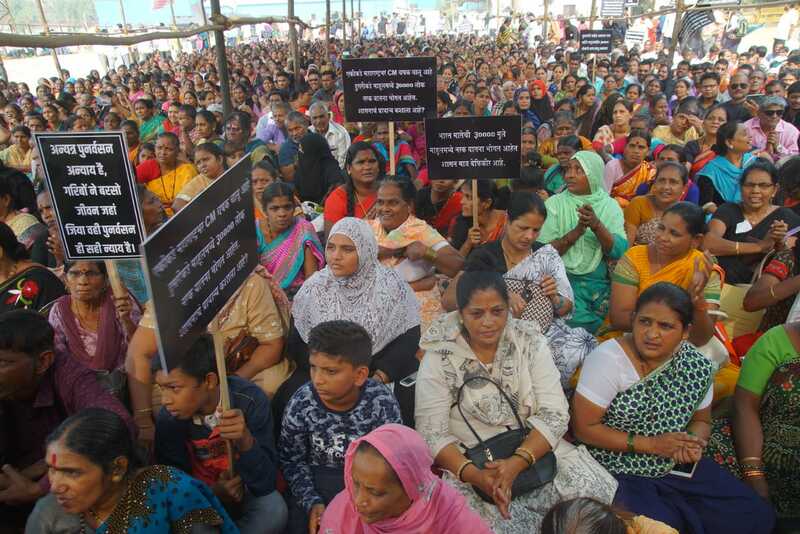 Over 7,000 Mahul residents, including senior citizens, women, children and chronically ill pollution victims marched upto Azad Maidan to present their simple demand to the Chief Minister Devendra Fadnavis – to honour the Mumbai High Court order instructing in no uncertain terms – to get the victims of ‘rehabilitation’ into #MumbaisToxicHell Mahul – out of that severely polluted hell and relocate them in a location safe for human life. The protesters have basically pressed for an end of the state-sponsored genocide/mass-murder of this entire community (over 150 pollution-related deaths so far and hundreds of people chronically ill and dying every week) by putting them in this fatal gas chamber against their wishes and against the orders of so many authorities. 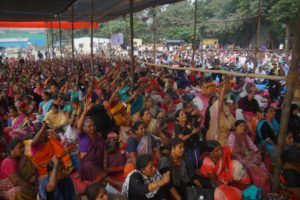 The Gathering Reached Azad Maidan: Police were sent as messengers to convey the message that the protesters should meet junior secretaries who are not authorised to take a decision on the Mahul such as Secretary, Urban Development and lower ranking officers. Already the Mahul residents have met a whole series of ministers and senior officials, ranging from the environment minister Ramdas Kadam to Housing Minister Prakash Mehta and various other BMC and other officials – all of whom have been unanimous in one statement – that they all agree that Mahul is dangerously and critically polluted, and no place for human beings, and that the CM Fadnavis is the only government figure presently standing between these 30,000 lives and their safe rehabilitation. The only thing awaited in this whole story of rehoming them is Mr. Fadnavis’ order, and he is mysteriously silent on the issue, pretending that none of this is actually happening, and as if the High Court order counts for nothing. Mr. Fadnavis, on the other hand left for Pune and refused to meet these people or save these many lives, choosing instead run away to Pune to play an ornamental visit to a sugar factory in Pune to make a speech and post happy tweets from there, pretending that none of this was happening in Mumbai. The agitators’ demand was clear – ‘send us a person who’s authorized to take decisions leading to the urgent and immediate rehabilitation of this community even acknowledgement of the issue ’ according to the High Court Order. No such dialogue was offered by the CM’s office today. Still no word from the CM’s office. The protestors decide that if the CM or his representatives refuse to meet them, then they will march upto Mantralaya to meet him. The gathering begins to proceed, and the police block the exits of Azad Maidan and positioned armed policemen, ready to attack the peacefully protesting Mahul residents, threatening that if they move anywhere out of Azad Maidan they would be attacked with weapons, thereby trapping the entire peacefully protesting gathering of thousands of people inside the maidan, misusing the public space as an unofficial ‘detention centre’ and the police force as ‘bouncers’ of a genocidal CM – all because the CM insists on continuing the state govt sponsored murder and poison-gassing of tax paying citizens and considers itself above the orders of the High Court, which the protesters are asking the CM to implement as their constitutional Right to Life as human beings. The only people who have benefited out of the demolition of the Tansa Pipeline slums and the rehabilitation hellhole project in Mahul are cronies from the construction mafia, who have been raking in the profits through generous FSI and TDR bonanzas and the corrupt politicians who have been supporting this real estate mafia and related scams.